In the midst of working on the finishing touches for the GFSC launch party, I decided to take a quick lunch break. I had to post a photo, it looks so beautiful! 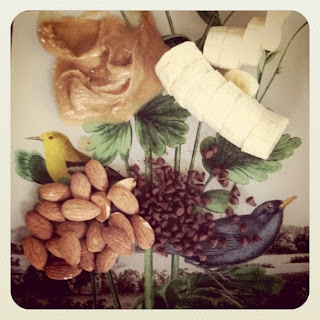 My favorite Almond butter, Maranatha, a banana, chocolate chips and almonds! To top off the wonderful salty and sweet combo- it is on my favorite plate. One of my closest and most fashionable friends gave me this plate for my 26th birthday! Thank you A. Flora!